Here is our long awaited pantry shelf. My dry goods are a source of pride with me. It is sort of funny that I have a picture of my pantry from everywhere I have lived. Some of these jars are as old as I am (that is 30 for anyone who is trying to figure it out). My mom was collecting these sturdy pickle jars from delis to store her bulk dry goods in when I was a little kid. 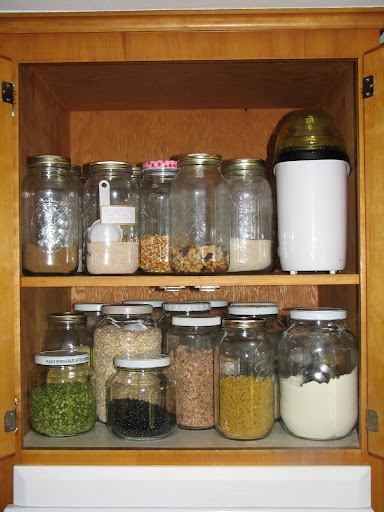 We had a huge cupboard under our sink and countertops in the little house, filled with glass jars of flour, oatmeal, rice, brewers yeast, etc. Everything was in a glass jar. 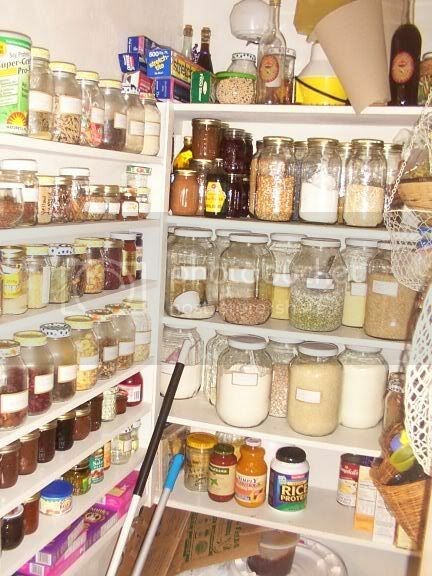 I always thought that is what a pantry should look like... lots of clean glass, filled with good whole dry foods. But always the jars remain the same old trusty glass jars that I have washed and refilled hundreds of times. I think I have only ever broken two. And one was in an earth quake when Don and I were first married. So that doesn't count, but let me tell you, a glass gallon jar of rice and 4 quart mason jars of homemade applesauce can create quite the mess. I am excited to have created this pantry in my new house. It is starting, slowly, to feel like home. I just put rub-on fairies and bugs up on Cyan and Logan's wall, I hung and filled some of our bird feeders and put out the bird bath, I put our bed side tables on the sides of our bed (imagine that. ;) ), I pulled the boxes of cloth napkins out and put them in newly fixed drawers, I did laundry with the dryer my handy husband fixed yesterday. Things are starting, slowly but surely, to feel like my home. I love your organization! Looks great! Thank you for sharing. I am always looking for creative ways to store my dry goods. That is one rockin' pantry! Thanks for the great ideas! I have had many of these forever... but, I have picked some up in the last little while from delis that sell pickles. Pickles have to be stored in glass. They get a funny taste from plastic. Sometimes you can even find them in these jars in the grocery store, but your best bet is to call around to delis in your area and ask for them. Another thing I have done in the last few years is down sized the number of things I store in gallons. I bought a dozen half gallon mason jars at my co-op for $1.49 a jar and then started storing the things I don't use quite as often in them. Like split peas. Unless you make split pea soup ALL THE TIME, you will never need two pounds (a whole gallon jar) of split peas hanging around your house. It is much more cost effective, and nice to look at, a full smaller jar, rather than a nearly empty huge beautiful jar. If that makes sense. The picture from the Maringo house pantry was when I was only shopping once a month. Now I go once a week and only stock up when I need to. This change has much more to do with changing income and circumstance than choice, but I feel like it is a good change. It means I don't have to store as much though. For most things the gallons are just too much. But I do store daily use things, flour, oatmeal, and things you use a lot of at one time (like pinto beans) in the gallons still. Wow, that is beautiful! Love, love, LOVE all those pretty glass jars. I know what you mean about a new house not really feeling like home until you start to break in the new pantry. Something about a well-stocked pantry just says "home" to me. Lovely post! I am having the same shelf in my kitchen where I have been keeping all the stuff that is required for cooking. I am intended to place every useful thing in that shelf for cooking.